One of the top shows on the Indian Television, the Indian version of British Show, “Who wants to be a Millionaire” hosted by none other than the Big B. Amitabh Bachchan who entered the small screen with this show, gave the show an intense feeling and made it his own. The show which began in the year 2000, has completed 8 seasons successfully one of which was hosted by another Bollywood Superstar Shah Rukh Khan. The ninth season which had commenced in August on Hindi TV Channel, Sony TV had run successfully and will be coming to an end with its final episodes airing on November 6th and 7th. The final episode will have Vidya Balan and Yuvraj Singh, Nobel Prize Winner Kailash Satyarthi as its guests. The episode has been planned with electrifying performances and audience interactions. The promos which have been released suggest that the episode might grab a better viewership than ever before. The show received the highest ratings and has replaced Khatron Ke Khiladi and the KumKum Bhagya which enjoyed a position on top in the past few months. The show also entertained the audience with special celebrity guests PV Sindhu, Shilpa Shetty, Abhishek Bachchan, and the whole Indian Women Cricket team with the captain Mithali Raj and Harmanpreet Kaur occupying the hot seat. The show’s popularity has also been better with the introduction of certain features for the lifelines like the video call instead of the voice calls in "phone a friend". The Narendra Modi’s initiative of Digital Currency has gained the attention of the shows as well or maybe this is for the promotion but this time, Contestants who win amounts will be paid digitally instead of a cheque. The show also poses a jackpot question that allows the contestants to win a whopping 7 crores in one go. This question which will be posed after winning the 1 crore is also a feature that intrigued viewers. Also, the special episodes which featured social workers and members from various NGOs have also been a huge contributing factor to the higher viewership. 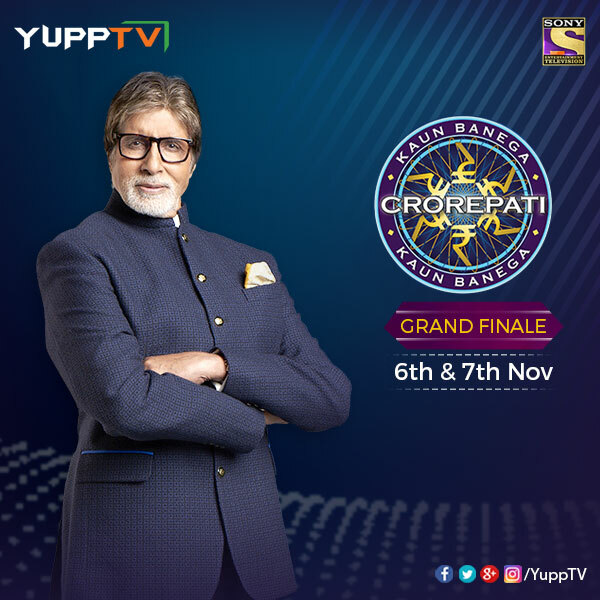 Catch the season finale episodes of Kaun Banega Crorepati on Sony TV Live through YuppTV this Monday and Tuesday.